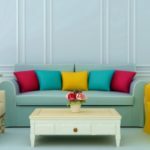 You would think that with a blog titled Creative Home Keeper, I would be a home keeping rock star channeling the likes of Martha Stewart: Clean house, gourmet meals, cute craft and DIY projects. But sigh… I am not. In fact I’m quite far from it. 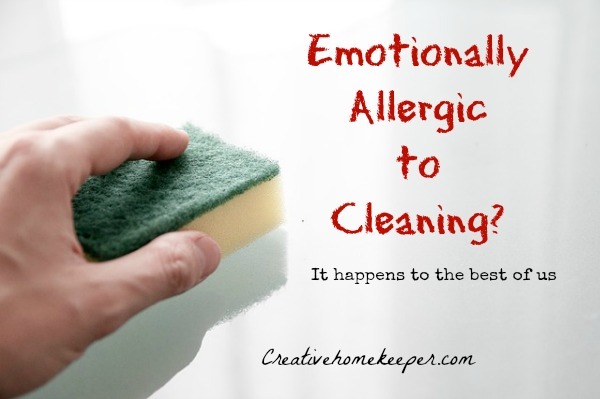 You might even say that I am emotionally allergic to cleaning. An important point to note is that I love a tidy house. 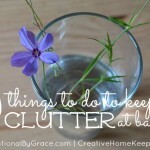 Clutter drives me crazy, so I am constantly trying to stay on top of keeping it picked up. But having a tidy house and having a clean house are two different things. Cleaning involves sweeping, mopping, dusting, and those dreaded toilets need to be scrubbed. It’s a lot of boring, tedious work that unfortunately needs to be done because as I have been told, those toilets just won’t scrub themselves! Another note is that I am also in a very busy season of life with a baby and toddler underfoot. Until they are old enough to really help with chores, the majority of the house cleaning falls on me. Some might wonder what my husbands involvement might be. Well he does a lot! He manages all of the exterior landscaping and mowing, maintaining the budget, paying the bills, home repairs, and most importantly his paying job that he works very hard for to provide for our family so I can stay home. So I don’t mind being the sole person responsible for the house cleaning, because he is doing his fair share too. I tend to avoid a lot of my house keeping duties like some avoid the plague. There are more fun things to do- playing with the kids, reading, completing a project, writing, going on a walk… and the list could go on and on. I push my chores until the end of the day, or during nap time, because deep down I tell myself the lie that if I complete them later in the day they just won’t take me as long to complete. That. Is. A. Big. Lie! They usually take twice as long to complete because my energy levels have been completely taped out by the end of the day. You see I’m a morning person which means from the time I wake up until lunch is when I have the most energy, my mind is working at its best, and I am super productive. So really this should also be the time I tackle the house cleaning tasks. So I have been trying really hard, and have been setting goals for myself to do those unwanted tasks first, or to eat that frog. If you are opposite from me, and thrive during the later hours of the day, I would still challenge you to also work at completing your chores early in the day so that way you can spend your peak hours doing what you love too! I also find it best to break down my house cleaning into manageable chunks. When you look at your home it can be very overwhelming to think of all those places that need to be cleaned. So I have a list of all the chores that I need to get done each week. I don’t assign days to them, like Mondays- vacuum, Tuesdays- dust, etc. Some weeks have days that are just busier than others and I would find myself behind before I even began. So I found it easier to just cross off my chores list when I have completed a task. dust- all main floor rooms (we currently do not use our upstairs bedrooms, when the kids get old enough to move upstairs, then I will add this). When I break it down to these lists, somehow it makes it seem more manageable. I also keep a monthly and yearly cleaning list of chores that don’t need to be done on a weekly basis, like dust light fixtures, baseboards, etc. To be perfectly honest, I REALLY have to find the motivation to complete these chores every month. 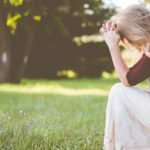 There are several paid for and free cleaning checklists available on the Internet, but my problem with those is that the person who created them almost always designed them for their needs and is simply sharing what works for them. There are really good ones too, so if you’re using one and it works for you, keep rocking on! What works best for me is to have the above list typed and printed out each week and then I cross them off as I complete them. Nothing fancy, just easy peasy! I am also trying to challenge myself to complete all of my chores by Friday, so that way Saturday and Sunday can be spent doing things I love outside of the daily house keeping. Having this sort of “unscheduled” cleaning routine is helping me to manage my allergies to cleaning. Another big motivator is to set a daily goal as to what time I want to have the chores completed by. I also realize that this is also a heart issue. Even more convicting is that it is a sin issue too. 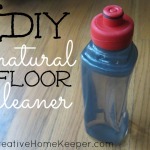 Keeping a clean and tidy house one way that we can serve our family. We might not always feel appreciated, but I can be pretty sure that the way our homes feel also helps dictate how our families feel too. Remember, we set the tone in our homes. I want my family to feel safe, secure, loved, and be able to find rest in these four walls of our physical house. So if overcoming my disdain for scrubbing those toilets can help my family feel that way, then you can bet I will be scrubbing those toilets! How do you overcome your cleaning allergies?